Welcome to an unique residence in Stockholm/Enskede which combines 60's interior design with functionality, comfort and access to nature. The spacious house has a large well equipped kitchen, 6 bedrooms, 2 bathrooms, the Penthouse with separate bath and pentry, a porch and a terrace. The large property has a designed garden and space for numerous cars. Even though the property is situated in a quiet part of Stockholm with forest right out the backdoor you will easily reach by feet a well equipped supermarket, several restaurants, a bakery, a late night 7-eleven store and 2 alternative subway stations(15 min to south city Södermalm). Stockholm International Fair is nearby, 8 min by car or 10-15 min by bus. There i several lakes nearby . With 5 years of experience of letting my home to private- and commercial guests I am looking forward to welcome you and to do what I can to make your stay in Stockholm extra special. Please leave the house with all accessory and fittings put back into their place; sheets are left on bedding sets at departure. Dinners and parties are ok but only for up to 15 people and with respect to neighbors. Please try to be energy efficient when using warm water, electrical heating and the showers and please do not leave doors and windows open unnecessarily. Safety deposit can be made in common currency of convenience. My name is Janu and I am an openminded and playful man in my late 40s. I live with my son of 8 in a house 15 min outside Stockholm. Some of my inrests are film, music, dancing, food, psychology och interior design. I love to get to know and hang out with people from all walks of life and to learn new things all the time. 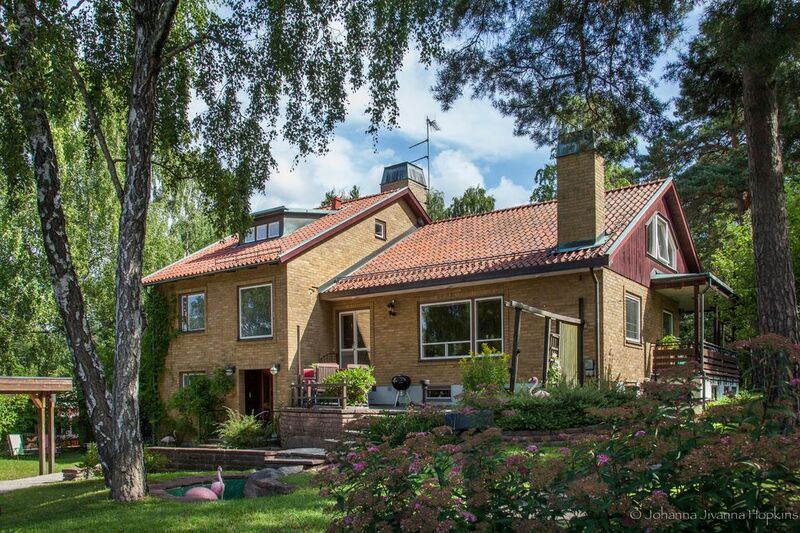 Villa Berkle is the perfect space for larger families and groups who want to explore Stockholm and its surroundings in a comfortable and affordable way. The house is practical, has good communication and an inspiring design. Space for 15 guests, unique 60's interior design, quiet and private and still close to city as well as natural surroundings. Sanitair en bedden prima. Kamermeubilair was te vies. Retro is prima maar mag best wel eens schoongeschrobt worden. Tuin prima,. We had a big group of friends staying here (8 of us). We loved the spacious living room and dining room. The fireplace was lovely. The metro is very near and it didn't take long to get to the city. There's a grocery store in walking distance. Janu, the owner, treated us well and was easy to work with. Also, the house is decorated well! The pictures are very accurate. Welcome to a unique preserved 60th century villa in the prestigious Stureby / Enskede. It combines period features with functionality, comfort and access to nature. The house has large living areas, a well equipped kitchen, 6 bedrooms, 2 bathrooms, the so-called Penthouse with separate bath and kitchenette, a balcony and a terrace. The plot is large with landscaped garden and parking for several cars. The house built in the 50's / 60's of Engineering, Lars Berkle that, wealthy and interested in interior design and technology not saved any funds that with much care and imagination to process every single detail in "Villa Berkle '. The villa is situated on the stem plot of a lung impasse and vents directly to the forest. IKA Quantum Bea with great food and household product range are within walking distance as well as subway Swedmyra and Stureby (12 min to Södermalm). For nightly purchase is a 7-Eleven on the main road and on nearby Parish Plan is access to restaurants and bakeries. Stockholm International Fairs can be reached by car (8 min) and municipal (10-15 minutes). There div bathing in the surroundings. With 5 years of highly successful experience in hosting private and corporate guests, I look forward to brighten your stay in Stockholm.